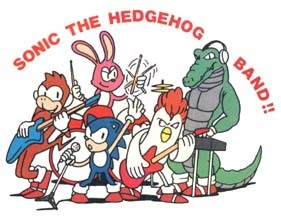 A new discovery within the Sonic community has unearthed new concept art for the original Sonic the Hedgehog game on Mega Drive that features the blue blur in a band, along with a host of new characters that would have predated Miles ‘Tails’ Prower as the hero’s sidekicks. The most interesting find was the above piece of art. The ‘Sonic the Hedgehog Band’ features Sonic and fellow animal characters Max, Mach, Sharps and Vector (that last one ring any bells, Chaotix fans?) rocking out, and was originally going to feature in a Sound Test screen within Sonic 1. This ultimately got canned due to space restrictions on the cartridge. Alongside this, it was also discovered that the original Sonic game was going to feature a lady character whose name translates to ‘Madonna’, and that Bean the Dynamite from Sonic The Fighters is actually the son of Bin from the old Master System game, Dynamite Dux. The details were found on a Japanese language Sonic secrets website which included a page on profiles for characters within the original Mega Drive games. If we come across any more details on the above, we’ll be sure to let you know. What a find!